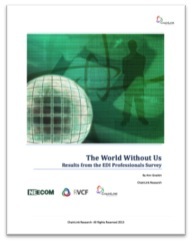 In early 2013, we asked EDI, B2B and e-commerce professionals to participate in an industry survey. The goal of the survey was to have a better understanding of current challenges professionals are confronting and to learn the technology and approaches used to manage various functions. The World Without Us, a 16-page whitepaper discussing the results of the industry survey, is available now as a free download. We, along with NEECOM, the Retail Value Chain Federation (RVCF), and ChainLink Research have mutually sponsored this research.